Drinking green tea is generally recognised as heathful, though scientific studies on this have been few. A new trial aims to determine whether green tea can prevent colon cancer -- the biggest such trial in the world to date, according to Thomas Seufferlein, director of the Department of Internal Medicine at Halle University Hospital in Germany and co-head of the research team. 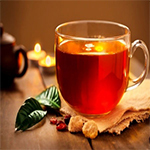 The study will investigate the effect of green tea on the formation of colon polyps, sometimes seen as precancerous. German Cancer Aid, a non-profit organisation that receives no public funds, is paying the entire 2.1-million-euro (2.8 million dollars) cost of the project with donations. "In the interests of the people concerned, we need to exhaust all possibilities for cancer prevention. This includes naturopathic therapies," said German Cancer Aid spokeswoman Christiana Tschoepe. The trial, comprising 3,000 participants, has just got under way. "They were recruited for a three-year trial, but since it's staggered, the last ones won't be finished until six years after the trial starts," Seufferlein said. Selected from 30 large medical practices and clinics throughout Germany, the participants have all had colon polyps removed and are seen as having a heightened risk of colon cancer. Researchers also want to learn whether green tea can help prevent a recurrence of the polyps. Along with bitter-tasting substances and caffeine, green tea contains the plant hormone epigallocatechin 3-gallate (EGCG). "Various research has shown that EGCG inhibits the formation of tumours of the prostate, breast and uterus," Seufferlein said. For simplicity's sake, the trial uses green tea in capsule form; the dosage is two capsules daily. "That's the equivalent of about five to ten cups of tea, depending on the method of preparation," noted Julia Stingl, a clinical pharmacologist at Germany's Ulm University and the other co-head of the research team. The capsules contain an extract with all of green tea's active components except caffeine, which has been removed. One group of participants receives capsules containing green tea extract, the other takes placebo capsules. Neither the participants nor the researchers know which group is which. "This makes an objective assessment possible," Stingl said. The trial participants are given a blood test every four months to check their liver and blood values. They are also asked whether they have drunk any green tea or taken medications. After three years, each participant has a colonoscopy to see whether, or how many, new polyps have formed. The co-heads of the research team concede that even if green tea is found to inhibit the formation of colon polyps, it is rather unlikely that Europeans will drink up to ten cups of it daily. Capsules with green tea extract are already commercially available, however. "Should its effectiveness be scientifically proven, the extract could be taken affordably in capsule form as a dietary supplement," Stingl pointed out.